This meal is going to become a regular around here. It was so good….and so so easy! I know I say that about a lot of recipes that I try, but really, that’s what I’m about, good simple food. I don’t have time to spend on complicated stuff, as I’m sure a lot of you don’t either. I didn’t have any corn, so I skipped it, but I’m sure that would be good. I was also going to add some shredded carrot to the shredded cabbage that I used…but I forgot. Next time. I went ahead and threw the cilantro into the chipotle cream. This chipotle cream is awesome. I loved it. I’m definitely going to start serving it alongside chips, salsa and guacamole from now on. It was perfect for dipping tortilla chips. Thank you Sara for choosing a great recipe for the group!! Go check out the Craving Ellie in my Belly blog roll to see everyone else’s version of Fish Tacos with Chipotle Cream! Stay tuned for tomorrow’s Barefoot Bloggers recipe…Chicken Piccata! In a small bowl, whisk together the oil, lime juice, salt and pepper. Pour over the fish fillets and let marinate for 20 minutes. Put the yogurt into a strainer lined with a paper towel and place over a bowl to drain and thicken for 20 minutes. Remove the fish from the marinade and grill on a preheated grill or nonstick grill pan over a medium-high heat until cooked thorough, about 3 minutes per side. Set the fish aside on a plate for 5 minutes. In a small bowl combine the thickened yogurt, mayonnaise, and chipotle pepper. Flake the fish with a fork. Top each tortilla with 1 tablespoon of the chipotle cream. 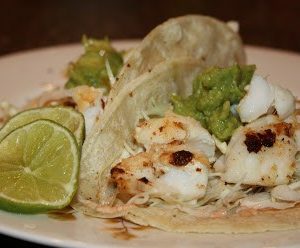 Top with fish, cabbage, corn and cilantro and serve with lime wedges.